Today I feel great that am going to discuss about my favs..i.e. 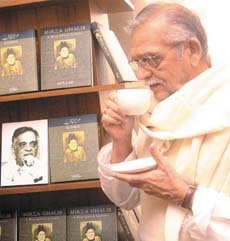 about poetry, music and Gulzar 🙂 ! 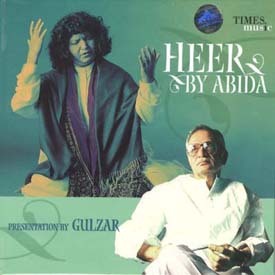 Yes, I was so surprised to see this CD called ‘Heer – by Abida & presentation by Gulzar’ – Thank You Friend for bringing this from the library as….usually its those historic & amazing movies which has made me eager to quench my thirst of curiosity and anxiousness about everything that did happen in history. I never knew that I could get these cd’s as well that too ghazals, sufi kalam wow….am a great fan of Abida Parveen….her voice has that intenseness which takes one to the depth of it and leaves them there lost…that’s exactly how I feel…and I often listen to her & that’s the reason her melodious voice is there in my Radio Blog. Try it out and am sure you wont regret it :). She is considered as the queen of Sufi mystical singing, but she is best with sufiana kalaam, be it in hindi, urdu, Punjabi, sindhi or saraiki. The songs in this Heer – album are written by Waris Shah – a great poet who is believed to be inspired by the pain of his own unfulfilled love. I always felt sad about this aspect…that only a person can bring out the true essence by suffering? Why?….why can’t a person be as good as being in love & bringing those emotions of being in love, whether parting with love & then getting re-united….all these can bring the essence but still the one who suffers only know the true pain of it …I guess :), that’s the irony part of it….which often made me to think about all those great talented & expressive people. This album also describes the romance tragedy of Heer – Ranjha (the famous lovers known for there love & sacrifice from Punjab). It also depicts the true culture of Punjab and the fragrance of its authenticity. ……who has often tried to bring the essence of the Bengali culture in his writings and the movies that have been made on those stories written by him. Poetry and Music are 2 things I cannot simply live without…A very special ode to what u love Dawn..great and informative read. 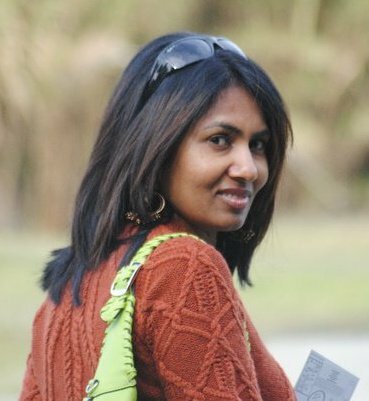 **and I guess that’s what makes life keep on going…to reach to a goal…a goal created by ourselves Whenever we reach one goal, there pops another to be reached…life is a never-ending goal-seeking journey 🙂Keshi. That’s really a good blog. Keep posting. After soo much build-up, i just want to get hold of a copy of this CD. Or is this album available for online listening?